Not everything is meant to be thrown into your dorm dryer. 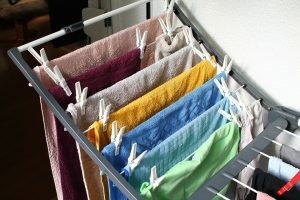 Items like jeans, leggings, and other delicates are supposed to be dried on a drying rack so they do not shrink or tear. However, this seems to be an easily forgotten for an incoming freshman. I would know, I didn’t remember either. It wasn’t until I was left with nowhere to dry over half of my clothes in my dirty laundry when my roommate pulled out her drying rack and reminded me that, yes, these were a thing, and I would need one. Target can be a great place to pick up a drying rack. CC Image Courtesy of Pixabay. I took a trip to the nearby Target and bought a cheap drying rack that ended up saving my clothes’ lives. Had I continued to have been lazy, those clothes would have a very sad life and wouldn’t have lasted much longer. Seems like I’m not the only one who thinks so- Youtube’s Tasha Farsaci also mentioned bringing a drying rack to college in her Youtube video, “10 Unexpected Things You NEED to Bring to College.” The post has over 280,000 views, so hopefully those 280,000 remembered to bring a drying rack! So before you ship off to college, remember, a drying rack is a must. Otherwise, your leggings and jeans may end up the size of what your six-year-old self once wore.